The technology of the online MV-CBCT imaging is currently used in many institutions to generate a 3D anatomical dataset of the patient in treatment position and to account for organ motion and set-up variations. It utilizes an accelerator therapy beam, delivered with 200° gantry rotation, and captured by an electronic portal imager. To make IGRT practical in a busy clinic and to use it for the reduction of treatment toxicity by margin reduction, it must be smoothly integrated into the patient set-up process. Quality control of these imaging modalities is a newly added task for physicists and therapists. Manufacturer's QA guidelines must be followed, and test tools must be used regularly. In this work, the procedures of commissioning of the MV-CBCT system are presented. The additional doses from MV-CBCT have been measured using TLD and ionization chamber. An assessment of was made to determine if it is necessary to subtract the measured dose from the prescribed dose of the patient or ignore it. The linear accelerator used in this study was ONCOR, (Siemens Medical Solutions, Malvern, PA) with double focused MLC delivery system. The Linear accelerator is equipped with an amorphous silicon flat panel fabricated for MV photons. The 41 × 41 cm 2 flat panel X-ray detector (AG9-ES, PerkinElmer, Optoelectronics) consists of a 1 mm copper plate and a Kodak Lanex Fast scintillator plate (Gd2O2S: Tb) overlaid on top of light-sensing and charge integrating thin-film transistor (TFT) array. The flat panel has 1024 × 1024 TFT detector elements with a pixel pitch of 0.4 mm. The detector is mounted on a retractable support which deploys in less than 10 seconds with a positional reproducibility of 1 mm in any direction (7). The entire imaging system operates under a prototype SYNGO™ based COHERENCE™ therapist workspace, which communicates to the control console, the linac and a local patient database. The workspace contains applications allowing for the automatic acquisition of projection images, image reconstruction, CT to CBCT image registration, and couch position adjustment. Each projection of the CBCT acquisition was corrected for defective pixels as well as for pixel-to pixel offset and gain variations before 3D reconstruction. The CT data set from MV-CBCT system equipped on the ONCOR linear accelerator can be acquired with one of three protocols. The first one delivers 4MU in arc of 200 o to performing the CT data set. The second and third one use 8 and 15 M, respectively. The tests covered the EPID system interlocks and imaging arm touch-guard interlock check. For proper operation of the imaging system, many of the safety tests should be performed. The most important tests are those for mechanical alignment stability and accuracy of the EPID and MV-CBCT. These were measured using electronic radiographs taken on daily basis. System interlocks were checked on room door; beam on, and with termination key. EPID imaging arm-touch guard-interlock switch was checked by applying low pressure to each of the four corners of the touch guard. Action on each touch guard corner activates interlock, and the corresponding movement stops. Gantry movements were checked when the touch guard is activated. System movement interlock was checked by opening and closing EPID panel laterally and longitudinally. The accuracy of patient position measurement strongly relies on the precision with which the flat panel was aligned. The physical position of the detector was carefully set with respect to the mechanical isocenter of the machine. However, residual longitudinal, vertical, and rotational misalignments must be accounted for. For this purpose, a reticule was delivered with the machine for quality assurance. The reticule (named "Xretic") which consists of two orthogonal tungsten wires, was inserted in its slots in the gantry head, so that the crossing of the two wires corresponded exactly to the beam central axis [Figure 1]a (10). A series of portal images at four gantry angles (0, 90, 180, and 270 deg) and four different sources to image distances (SIDs), (130, 140, 150, and 160 cm) were acquired [Figure 1]b. For each gantry angle/SID combination, the position of the projection of the wires on the flat panel was compared to the position of the central row and column of pixels of the detector, and the residual misalignments were calculated and stored. Additionally, a second series of portal images at SID of 145 cm was acquired at eight different gantry angles (0, 45, 90, 135, 180, 225, 270, and 315 deg). The residual offsets from this series were used specifically for MV-CBCT images. This alignment test was performed as the daily EPID QA. The pixel offsets are automatically updated every 5 min by averaging ten images for each integration time in steps of 200 ms between 285 and 1485 ms, when the beam is off. To obtain the gains for portal imaging, an image was acquired with a non-attenuated beam with a known dose at low and high dose rates for the 6 and 10 MV photon energies at seven different SIDs: 120, 130, 140, 145, 150, 155, and 160 cm. The gains were derived from the known dose deposition in each pixel and the offset-corrected pixel values. When the panel is used at a different SID, the gains are linearly interpolated between the two closest calibration distances. A dead pixel map was then created using 100 images acquired with a non-attenuated beam, accounting for defective pixels. A pixel was marked as defective if its white noise (as measured by the standard deviation of its value over 100 white images) was more than six times higher than the overall standard deviation over the entire panel; if its dark noise was more than six times higher than the overall standard deviation over the entire panel; or if its corrected value for offset and gain deviated by more than 1% from the median value of its 9 × 9 neighbors. The value for a dead pixel was replaced by the average value of the active adjacent pixels. An additional gain calibration procedure was performed specifically for the cone beam mode: A non-attenuated cone beam arc was acquired with the 15 and 60 MU protocols, and the gains were derived for each of the 200 projected frames. Checking cone beam calibration test using calibration phantom. 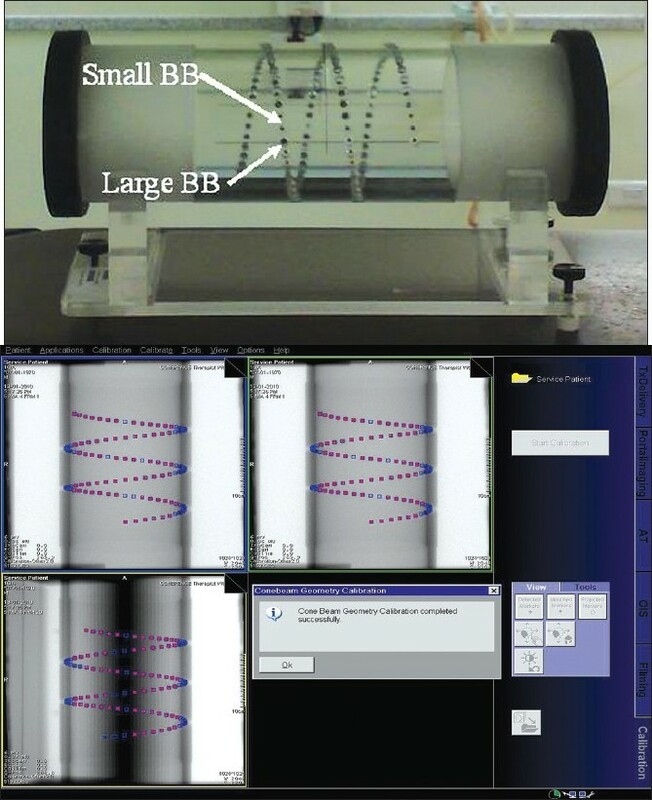 The Geometrical phantom manufactured by Siemens contains 108 X-ray-opaque tungsten ball bearings (BB's) of two sizes, small and large (3.2 and 6 mm diameter, respectively), which are embedded to form a single helix as shown in [Figure 2]a. Their known coordinates are used to calculate the transformation matrices projecting the three-dimensional voxels in the reconstruction volume to a two-dimensional pixel on the flat panel. For geometrical calibration accuracy test, a CT set for the Geometrical phantom was acquired and the MV-CBCT system was calibrated to the manufacturer's specifications. In this test, the software makes the registration of the acquired CT set of the geometrical phantom by fusing with the standard image of that phantom. A quality factor representing the mean geometric error in BB positions was used to classify the projection matrix as valid or invalid, and a correction for failing projections was used by interpolation. [Figure 2]b shows the overlapping of the acquired geometrical phantom image with the standard image from the software data base. The software gives a message about the performance of the calibration. In the MVCB QA phantom (starting from the end facing toward the gantry), Section 1 is a 4 cm uniform solid water cylinder that is used to check image noise and uniformity. MV-CBCT study set was taken for the QA phantom. The CBCT image set was reconstructed with 1 mm slice thickness, using the "smoothing head and neck" filter. The transverse slices were then displayed on the Siemens Coherence workstation using the adaptive targeting window. On the central slice of section 1, five circular regions of interest (ROI) were drawn; one in the center and four in the periphery at 0, 90, 180, and 270 degrees. The center slice of section 1 is loaded on the 2D Viewer. 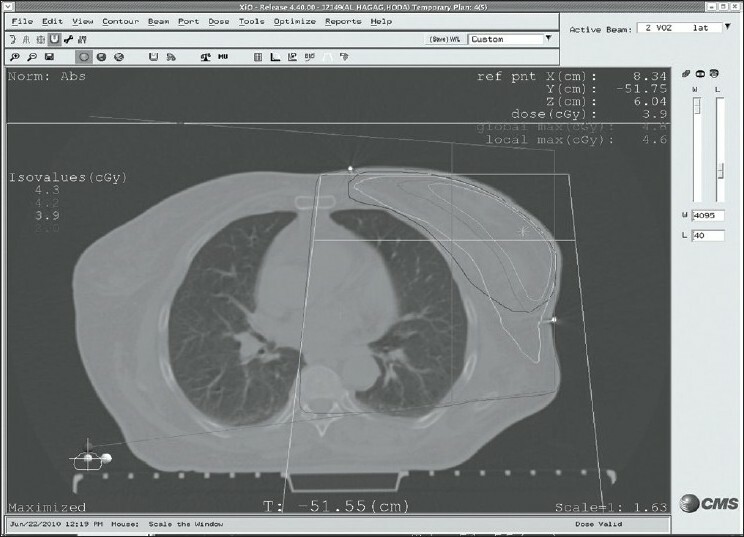 Automatically 5 ROIs are generated on the image in the axial view. The mean and standard deviation values of each ROI are checked and the expected results will show below the measured values. In this check, the center ROI is used as a reference. The difference between the mean pixel value of each ROI and the mean pixel value of the center ROI is calculated and determined if that value falls within the expected range value from the following data. Image reconstruction artifacts due to dead pixels or wrong gantry rotation speed can also be visually checked on each slice of Section (1). Sections (2) and (4) which contain inserts of different materials inside solid water background, as shown in [Figure 4]a and b. The relative electron density of each material with respect to the background is reported in [Table 1]. The low contrast resolution was qualitatively checked by adjusting the window and level to preset values and counting the number of inserts of each material that are visible on the image. [Table 2] lists the circles that should be visible in each of the 8 groups in sections 2 and 4 for 6MV image acquisitions. Section (3) of the MVCB QA is used to analyze spatial resolution of the image. The largest line group to the sixth largest group (corresponding to 0.30 lp/mm) should be visible with all five dark lines distinctly visible. Lines 7 to 16 are not resolvable with the current technology. 1 through 6 should be distinctly visible. 7 through 11 should not be distinctly visible. The additional doses to patient from MV-CBCT and EPID images, which were acquired to check the correct patient position before treatment delivery, were evaluated and measured with two different techniques. In the first technique, a 0.6cc farmer ionization chamber was placed in the center of a 3D solid phantom of dimensions 30 × 30 × 30 cm 3 . The phantom was placed in the radiation beam such that the center of the ionization chamber was located at the treatment machine isocenter. MV-CBCT study set with 5MU protocol; and pair of orthogonal EPIs (Electronic portal images) were acquired. Each image was acquired with 2MU and a dose from each set-up verification technique was measured. In The second technique; TLDs were placed in a human pediatric phantom and the images were acquired for the MV-CBCT study. The dose at the plan isocenter was measured either from MV-CBCT or EPIDs by using the TLDs. The dose distribution from the two orthogonal EPIs in a left breast case was measured. The doses were reported and compared with that calculated by the treatment planning system. [Table 3] reports the differences between the measured and the expected positions for the four beads in the inferior slice of the QA phantom. As shown in this Table the maximum differences between the expected and measured beads positions was 1 mm and so for all other beads in the superior and middle slices, the differences were within the recommended ±2 mm position precision in all three directions. Variations of up to 0.3 mm in the reconstructed position of the beads over the five consecutive scans for the same phantom position were observed. However, uncertainties in the subjective, user-dependent placement of the reference point at the center of the bead could contribute to these variations. The registration of the MV-CBCT image to the planning CT yielded offsets that were all within ±2 mm of their nominal value. [Figure 5] shows the middle slice of section 1(uniform solid water) of the MV-CB QA phantom and the five ROIs along with their mean pixel values and standard deviation. The standard deviation in the center ROI was 28.8 where the acceptable range according to Siemens protocol is a standard deviation between +26 and +42. That indicates current results are within acceptable limits. The measured mean value of pixels for the central ROI was 19.5 which indicates that this value is within acceptable range of -30 to +42. The maximum difference in the measured mean pixel values between the central ROI and the peripheral ROI was 49.5 and this value is also in the acceptable range of ±80. The commissioning results with the 15 MU protocol, showed that the low-contrast resolution did not allow visualizing a 2 cm object with 1% and 3% contrast. 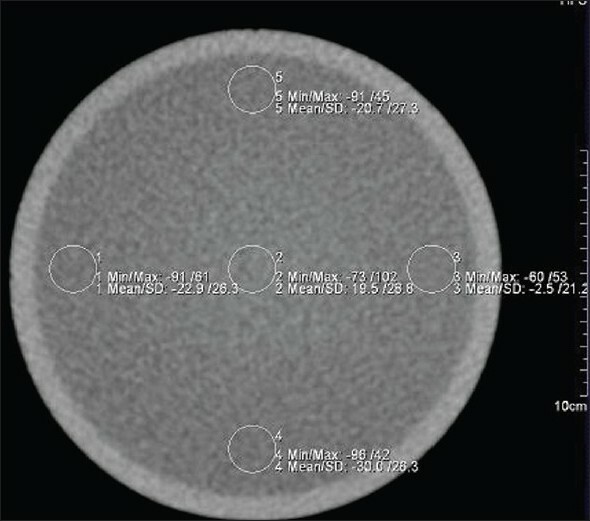 However, for high contrast, a 5 mm object with 18% contrast, and a 3 mm object with 50% contrast, were visualized. [Figure 6]a and b shows slices of Section 2 and 4 of the image quality phantom. In Section 2, as in [Figure 6]a for low contrast medium; four, three, zero, and zero inserts for the liver, brain, 3% Standard Imaging Grade (SIG) solid water, and 1% SIG, respectively were counted. In Section 4, five, five, four, and four, inserts for air, CB2 (bone -50% mineral), inner bone, and acrylic, respectively was counted. According to the manufacture specifications the spatial resolution for Siemens Mvison MV-CBCT is accepted where bars in group 6 which corresponding to 0.3 1p/mm are clearly visible [Figure 6]c.
The results showed that for MV-CBCT with 5MU protocol the dose to plan isocenter was 5.1 cGy for head and neck where the isocenter was located at the middle plane of the head. The dose for mid-plane of the chest was 4.8 cGy while for the pelvis sites the dose was 4cGy. These doses were larger for superficial organs which may be critical organs as the lens in the head and neck sites. The dose to eye during set-up verification for the head and neck case using MV-CBCT with 5MU protocol was 6.7 cGy and the dose to lung was 6 cGy during set-up verification of the Mediastinum. For EPID the dose at plan isocenter from the two images was 3.8, 3.5 and 3 cGy for head and neck, chest and pelvis respectively, where the EPID set-up verification was acquired with 2 MU for each field. As in MV-CBCT the dose for superficial organs which located in the entrance of the two orthogonal verification beams was larger than the dose at isocenter. [Figure 7] shows the calculated dose distribution from the two orthogonal fields of EPID set-up verification for a left breast case. This study case showed that in case of superficial and one sided tumors these two orthogonal fields give homogeneous dose to the target so these two fields can be included in the original treatment plan of such cases. The calculated dose at plan isocenter was 3.9 cGy which matched with measurement results using TLD in the human phantom where the average measured dose were 3.8 cGy. Intensity modulated radiotherapy with steep dose gradients has allowed the delivery of higher doses to the tumor volume while maintaining the sparing of the surrounding normal tissue. In this situation, verification of patient set-up just prior to radiation delivery is a crucial step. The mega voltage EPID has the ability to adjust display contrast to assess the target position and to help the radiotherapist to adjust the patient promptly. The difference in spatial resolution between the MV-CBCT and the planning CT data sets is small compared to that between noise and contrast. This allows the use of fixed small objects when registering two data sets, such as surgical clips, if they are located around a tumor, or implanted fiducially. It should be noted that the resolution is limited by the pixel size on the image. Under standard conditions, the CBCT images use 256 × 256 pixels. At the fixed SID of 145 cm, the field size is fixed at 27.4 cm 2 . Since the possible reduction of the longitudinal field size by the collimator does not affect the pixel size, it is fixed at 1.07 mm per pixel. The use of 512 × 512 reconstructed images decreases the pixel size by a factor 2 which can be increased to factor 4 in case of 1,024 × 1,024 pixels, thus increasing the spatial resolution; however using them for localization purposes, increases the reconstruction time of the CB image, it also decreases the signal strength drastically and needs more MU. A MV-CBCT system for patient localization was clinically commissioned at our institution. The initial geometry calibration to reconstruct volumetric images from 200 two-dimensional projections was performed, and the position accuracy of the system has been shown to be within 2 mm in the AP, LR, and SI directions. The image quality, parameters such as image noise, uniformity, low contrast, and high contrast resolutions were verified using an image quality phantom. The results showed that current resolution is inadequate to detect low contrast structures such as prostate. Daily and monthly quality assurance programs are important to insure that the EPID and the CBCT are working in a proper manner. According to the set-up verification protocol the measurements, the additional doses from MV-CBCT with 5 MU and EPID with 4 MU are not surprising, but in case of the higher MU protocol, dose from the set-up verification fields or the CBCT study should be added to the patient treatment plan. 1. Moyed M, Olivier G. Comparison of daily on line ultrasound and MV-CBCT localization data for poststatectomy cancer patients and implications for PTV margin expansion. IFMBE Proc 2009;25:780-3. 2. Wertz H, Stsepankou D, Blessing M, Rossi M, Knox C, Brown K, et al. Fast kilovoltage/megavoltage (KVMV) breathhold cone-beam CT for image-guided radiotherapy of lung cancer. Phys Med Biol 2010;55:4203-17. 3. Jacob R, Hanlon A, Horwitz E, Movsas B, Uzzo R, Pollack A. The relationship of increasing radiotherapy dose to reduced distant metastases and mortality in men with prostate cancer. Cancer 2004;100:538-43. 4. Lee N, Xia P, Fischbein NJ, Akazawa P, Akazawa C, Quivey JM. Intensity modulated radiation therapy for head-and-neck cancer: The UCSF experience focusing on target volume delineation. Int J Radiat Oncol Biol Phys 2003;57:49-60. 5. Kuban D, Pollack A, Huang E, Levy L, Dong L, Starkschall G, et al. Hazards of dose escalation in prostate cancer radiotherapy. Int J Radiat Oncol Biol Phys 2003;57:1260-8. 6. Hurkmans CW, Cho BC, Damen E, Zijp L, Mijnhee BJ. Reduction of cardiac and lung complication probabilities after breast irradiation using conformal radiotherapy with or without intensity modulation. Radiother Oncol 2002;62:163-71. 7. Tubiana M, Eschwege F. Conformal radiotherapy and intensity-modulated radiotherapy: Clinical data. Acta Oncologica 2000;39:555-67. 8. Gayou O, Parda DS, Johnson M, Miften M. Patient dose and image quality from mega-voltage cone beam computed tomography imaging. Med Phys 2007;34:499-506. 9. Pouliot J, Bani-Hashemi A, Chen J, Svatos M, Ghelmansarai F, Mitschke M, et al. Low-dose megavoltage cone-beam CT for radiation therapy. Int J Radiat Oncol Biol Phys 2005;61:552-60. 11. Gayou O, Miften M. Commissioning and clinical implementation of a mega-voltage cone beam CT system for treatment localization. Med Phys 2007;34:3183-92. 12. Bissonnette JP, Moseley DJ, Jaffray DA. A quality assurance program for image quality of cone-beam CT guidance in radiation therapy. Med Phys 2008;35:1807-15. 13. Barrett HH, Gordon SK, Hershel RS. Statistical limitations in transaxial tomography. Comput Biol Med 1976;6:307-23. 14. Miften M, Gayou O, Reitz B, Fuhrer R, Leicher B, Parda DS. On the incorporation of daily dose from online mega-voltage cone-beam CT in IMRT. : Proceedings of the XV th International Conference on the Use of Computers in Radiation Therapy; Toronto, Canada 2007. p. 428-32.